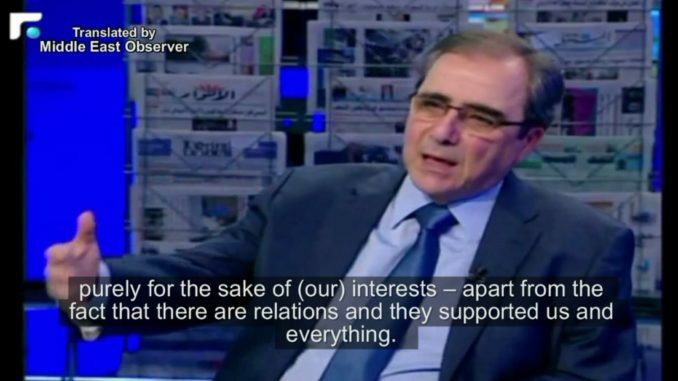 In a recent interview, former Lebanese Minister Sami Haddad said that Lebanon should appease Gulf & Western states for the sake of his country’s economy. – Haddad: Did we take an impartial (stance) regarding Syria? – Host: Must Lebanon be more attractive? – Host: What is required of us to do? – Haddad: Let me tell you…our economic interests are with whom? Whether we like it or not – our economic interests lie with the Gulf states and the West. Not with other people. – Haddad: Right…(we’re talking about) interests here. So these people – the Gulf states and the West – we need to appease them – purely for the sake of (our) interests – apart from the fact that there are relations and they supported us and everything. – Host: Yes…how do we appease them? – Haddad: Firstly we should not provoke them politically and attack them..
– Host: And attack them…okay. – Haddad: Yes. And secondly, (we need) to tell them we are an important market, and we welcome investment, and we provide facilitations for that. Ultimately, there is nothing but investment which can create job opportunities. You need to bring – you need to warmly welcome the Lebanese investor so that he comes back – the Gulf investor, the foreign investor…these are the ones that will revitalise the country. – Host: Is the country ready to welcome all these (people)? Is it required to make new regulations, is it required to give – to change (current) laws? – Haddad: Well you can make regulations and laws and change abit, but the most important thing is stability. If things become stable, and the (parliamentary) elections take place as they should, then we would have taken great strides forward.